Making your own Vanilla Extract is extremely easy, and is much less expensive than purchasing it. Plus, it makes an excellent gift that anyone is sure to enjoy! Below is a simple recipe for homemade Vanilla Extract, but please feel free to adapt the recipe to fit your taste. Split vanilla beans lengthwise with a knife, leaving the seeds inside intact. Place vanilla beans in a jar, cover with alcohol, and cap tightly. Agitate the mixture by shaking the jar once per day for approximately 4-6 weeks. The mixture will turn a dark brown color, and will become stronger in flavor with time. 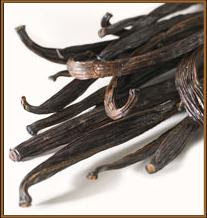 You may infuse the vanilla beans for as long as you would like, and can also add new vanilla beans to the jar to make a stronger and more concentrated Vanilla Extract! Once that the flavor of the extract has reached the desired strength, strain the vanilla beans out, and bottle the resulting extract. Amber colored bottles are preferred, but any glass bottles may be used. To make the bottles even more attractive, you can insert a vanilla bean into each bottle. If giving as a gift, then you can also tie a ribbon around the neck of the bottle and attach a label listing the ingredients and date created. Vanilla extract will last indefinitely, and will become even more pronounced in flavor as it ages. Homemade Vanilla Extract may be used in exactly the same manner as commercial Vanilla Extract. I buy Certified Organic and Biodynamic Certified Vanilla Beans from Mountain Rose Herbs.